Oh hey, when did it become August? I had it in my mind to do my annual comic-con roundup but my schedule took over any personal writing about the event. If there’s one constant with comic-con, it leaves me in a state of exhaustion — even just thinking about it — weeks later. Throughout the convention, I was looking for stories that might be used on Zagat but I knew as soon as I pitched the story that I wouldn’t find anything. My wrap-up was lean but in the end, I made a lot of new acquaintances and friends who loved to talk about food. One was Amy Chu. I know her from the different comics she writes for DC Comics and Vertigo. We connected via Twitter before the convention and met up for breakfast on Thursday. And she’s a foodie too! Last year, she moderated the Creativity and Comics panel featuring JustJenn and C.B. Celbulski, as well as a few local food personalities. Knowing about my goal to find something Zagat-worthy, she introduced me to other people with a toe in the food world. 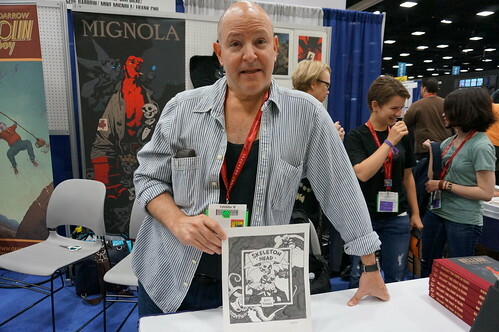 One of them was Mike Mignola, creator of Hellboy. He designed a wine label for an unreleased syrah. Also along that vein, I spoke to Shannon Wheeler of Too Much Coffee Man several times about his work with Gigantic Brewing Company, a Portland beer company, for a Belgian-style black ale. He tried to get the company to FedEx me a bottle to try but it was too short notice. I also crashed a party sponsored by Wired Magazine and made fast friends with the guys serving up beer floats. They filled me with Ben & Jerry’s ice cream swimming in Brewery Ommegang beer. 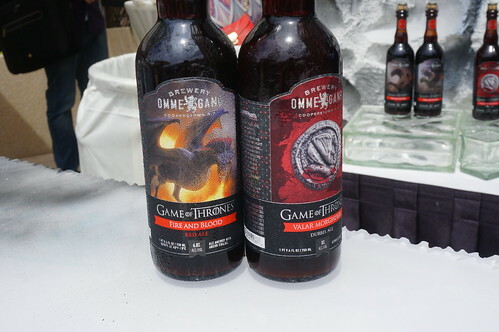 Also equally delicious were the Game of Thrones Beer that was served at the cafe and at the Marriott nearby. On Saturday I had a opportunity to eat away from the convention center at Puesto. A bunch us were collapsed on the restaurant’s patio when we spotted Paul Rudd walking by with a huge entourage. About an hour later, they were walking in the opposite direction. I don’t think I initially spotted Michael Douglas the first time, but there he was. I attempted to run up but was stopped by the group’s hulking security guards saying they didn’t have time. Later that evening on the way back to the parking lot on the way home, Paul and I spotted an entourage of black SUVs and crowds gathered by the Hilton. We waited and soon saw many of the cast for upcoming Marvel movies heading out. Among those we spotted were Michael Douglas, Chris Evans, Robert Downey Jr., Paul Bettany, Jeremy Renner, Cobie Smulders, Elizabeth Olsen, Aaron Taylor-Johnson, James Spader, Chris Hemsworth and a few others that were missed in the melee. As far as costumes went, there seemed to be a significant decline. Gone were the steampunk costumes (maybe it was too hot?) but I had my favorites. 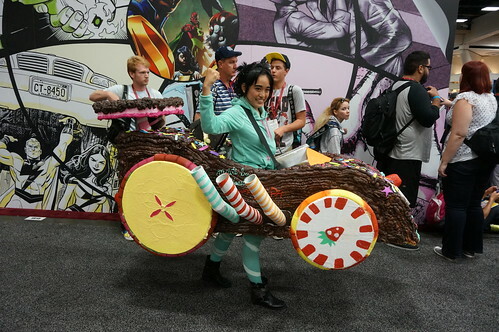 A stand out was this gal dressed as Vanellope von Schweetz from Wreck-It Ralph. 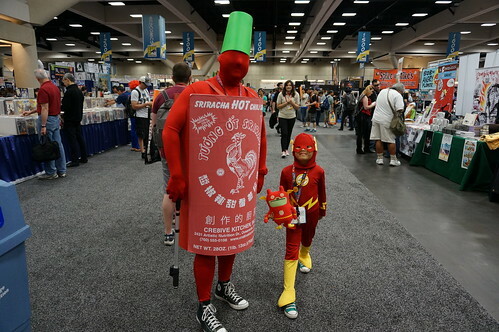 And I couldn’t resist taking a photo of this guy dressed as a Srichacha bottle. 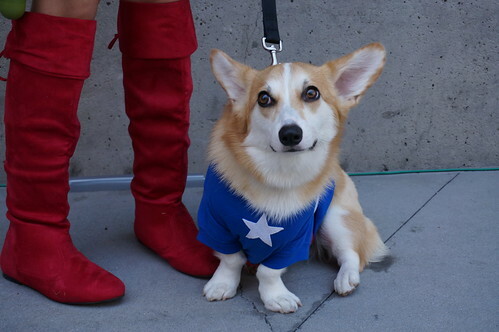 Also, who could resist a dog in costume? Certainly not me. The most common complaint I heard throughout the convention was the food. 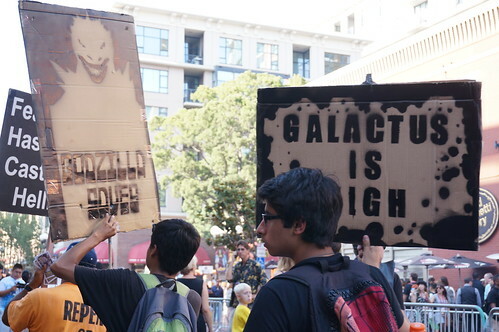 Many restaurants near the event replaced their regular menus with comic-con-centric menus and at inflated prices. 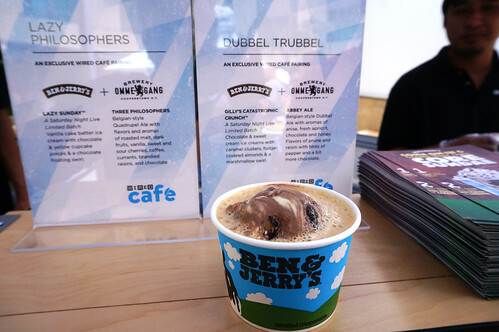 For Zagat, I compiled a bunch of comic-con-related foods and drinks and have to agree. I spotted at least four drinks called Kryptonite and other dishes that made no rhyme or reason. Like why would Aquaman serve fish ‘n chips? 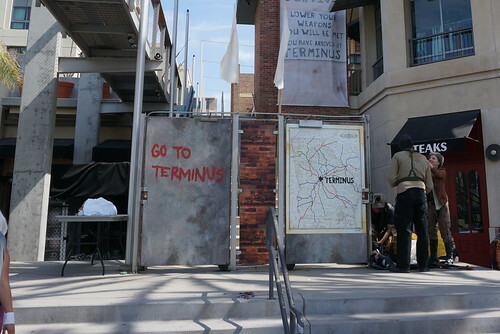 Check out Paul’s full writeup about comic-con here. 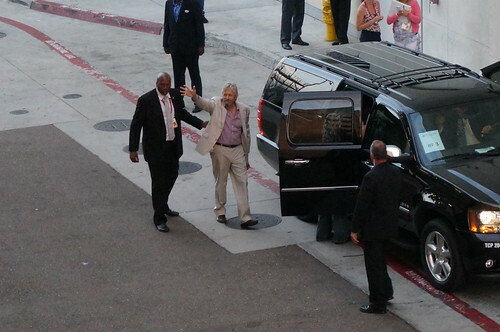 So many celebrity sightings! I agree with you about the overinflated food prices. I saw quite a few press releases for “Comic Con” special cocktails and food items that just seemed ridiculously high. One thing I have been noticing the past few years though is the growing amount of free food available. D and I used to bring a cooler and food to get us through the day, but this year after the first day we just ditched that because there seemed to be free food everywhere from the snacks at the lounge in the Marriot to pizza at Petco Park for the TNMT promotion, etc.